The history of Girton’s church goes back many centuries, and every generation has adapted the building to meet the needs of the time. As your rector, part of my job is to help you, the community using the building, to uphold this tradition of keeping the facilities relevant to current requirements whilst respecting the beauty of our inheritance. Minor changes happen all the time and are barely perceptible, but once every century or so the time comes to consider more substantial changes, in a process known as “reordering”. Attractive as the building is, many aspects are unfit for the 21st century, most notably the heating system. We also find that the layout of the church is very restrictive for some services including funerals. As members of the electoral roll, you are our worshipping community and the primary purpose of the building is to meet your needs. Hopefully you would agree with the view that the building must also be useful to the wider village community. A church can be a wonderful venue for concerts, meetings and exhibitions as well as the traditional baptisms, weddings and funerals. If our faith is to be relevant to today’s society, the building in which we practise that faith must be relevant too. 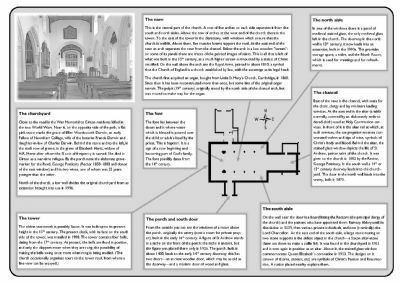 The Parochial Church Council and I have been working for some time on a feasibility study for a reordering project. 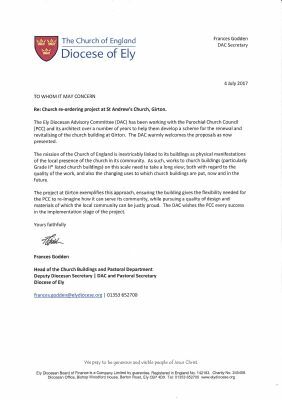 As you may know, the church is a grade II* listed building and there are a great many approvals we have to obtain before we are allowed to change anything. We have written Statements of Significance and Need for the Diocesan Advisory Committee and these have been accepted. We have also had visits from The Victorian Society, The Society for the Protection of Ancient Buildings, The Churches Conservation Trust and English Heritage who have all made supportive reports. A list of the main things we want to do is on the back of this letter. We do not have to do all of them at the same time, though inevitably some phases do have to be done in the right order. Such a project is a major financial venture and will cost far more than we could hope to raise as a congregation. The current plan is to approach a number of grant giving bodies, and ultimately the project stands or falls on the success of this. However, we know that most funding bodies will expect some direct contribution from the community that will benefit from the project, and it is inevitable that we will be appealing for funds from members of the electoral roll and in due course, the wider village community. I would urge you to think and pray about this project and consider whether you will be able to help achieve our aim of a warm flexible space for the benefit of the whole parish. We do not need donations immediately, but it would be enormously helpful if you could let me know if you feel you will be able to support us financially when the time comes to get started. We are far more likely to get grant funding if we can demonstrate a commitment to the project from the people who will benefit. Finally, I know that any change to a historic building is significant. However, I and the PCC believe that the changes are necessary and beneficial, and we will do everything we can to do them sensitively and respect our common heritage. · An improved heating system. Whilst it is not possible to make a mediaeval building in the middle of winter as comfortable as a living room, we are confident that we can do better than now. The replacement system is likely to be a mixture of underfloor and wall mounted heaters, and the design will be as “green” as we can manage. · A new stone floor, both to accommodate heating pipes and to provide a level and aesthetically pleasing surface. · More flexible seating. The existing fixed pews are very restrictive, so we intend to remove some and make others movable so that a variety of different seating arrangements can be achieved with the option of creating more open space. We especially need to be able to open up more space in front of the congregation. · Relocation of facilities for serving light refreshments into the west end of the church, enabling more space to be opened up in the North Room. · Storage cupboards for necessary supplies and equipment to keep the church tidy. · A better sound system and discreetly installed facilities for audio-visual presentations. · Modernising the electrical system and improved lighting. What is there at present? Your village church is getting a Makeover! St. Andrew’s Church has been at the centre of Girton since the 1100’s. The building would not have looked like it does today as it has been added to during subsequent centuries, right up until the Victorian addition of the vestry. Major interior refurbishments were done in 1853 and again in 1920, thanks to Fanny Coombe. We now want to ensure that it meets the needs of the 21st century by updating the facilities of the church for not only church members, but for the wider village community and beyond. We want to retain and enhance the history of the church, while making it into a more comfortable, welcoming place. Everything we plan to do has already met with the approval of the diocesan registrar, Historic England, the Victorian Society, the Society for the Protection of Ancient Buildings, and the Churches Historic Trust; and we are not getting rid of all the pews! Plans include a new and sustainable heating system, a new floor to replace the current uneven hodgepodge, new audio-visual facilities for films and presentations, and space for events of many different kinds. Better access and facilities for the disabled is a priority. At weddings, funerals and baptisms there are sometimes adverse comments about crowding around the chancel step, and this refurbishment project will open up all the space. We have plans for the church to become a lively and vibrant part of the community. Whether you are organising or coming to a concert, an exhibition or a talk, or you just want some quiet time, St. Andrew’s will soon have much to offer individuals and village organisations. So that is why we have set up the ‘St. Andrew’s Makeover Appeal’. The congregation has already raised a lot, but now we need to raise a further £300,000 to achieve these aims, and this is why we are asking for help. Please give what you can - every donation counts; all donations will be used solely for this reinvigoration of our building, not for other church functions. Thank you so much. How can I donate to the St. Andrew’s Makeover Appeal?